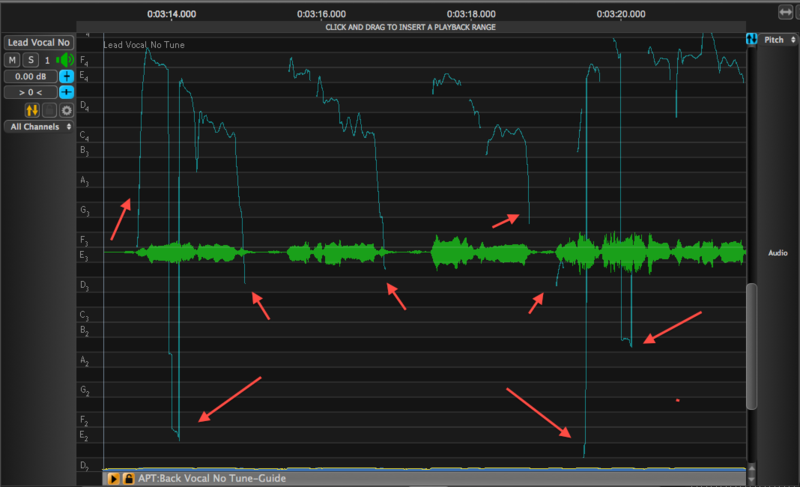 Sometimes, a Guide signal might contain characteristic jumps in pitch that we do not want to transfer to a Dub voice. One example previously mentioned is a Guide voice with a sometimes "rough" sounding characteristic and a smoother Dub voice. Revoice Pro can now help these types of situations by restricting the pitch detector to deliberately not be able to measure the octave pitch jumps and measure the 1st harmonic (or octave) instead. Forcing this "error" in measurement actually makes the automatic pitch transfer work. The image below shows around 8 seconds of a Guide voice (lead vocal) that is being displayed in the full height track display with the "pitch" scale expanded to show notes and offset to show the Guide's pitch measurements. The Guide voice is sometimes "rough" sounding, and at the times this is heard, the pitch trace can be seen jumping down an octave in places marked by the downward-pointing arrows. It is important to stress that these are accurate pitch measurements. The upward-pointing arrows show where there are fast up or down pitch transitions from or to lower notes, but these can be seen to be in low level (quieter) parts of the signals and do not make the voice sound rough. In contrast, the Dub voice pitch, shown below, does not sound rough (i.e. it does not have such large pitch jumps). It does have pitch similar transitions at the ends of words (in quite parts) like the Guide. 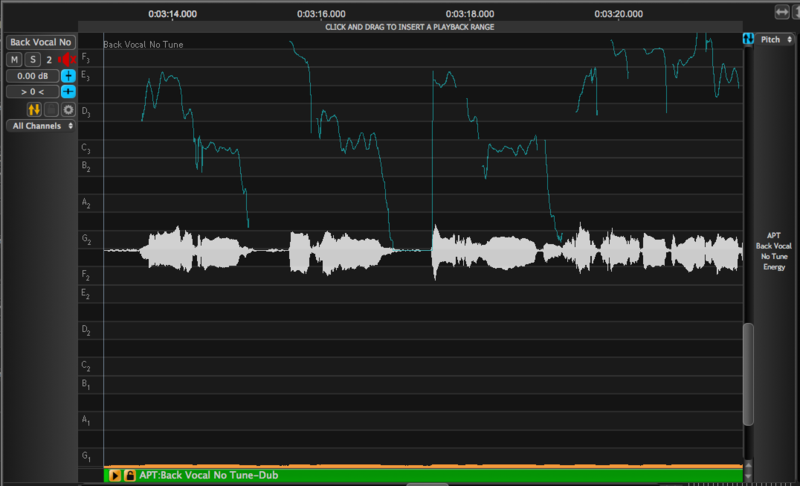 But you can see from the note labels that the Dub is sung one octave below the Guide voice. So if we want to adjust the Dub voice pitch to match the Guide, it will not sound right to lower it's pitch one extra octave when the Guide voice drops an octave (unless the Dub pitch was dropping at the same time - which it doesn't do). One possible solution to this problem is to insert Protected Regions in the Dub to stop the pitch being edited when the Guide pitch is wrong. This is not the best solution for two reasons: Firstly, it would take time to insert the many Protected Regions needed and secondly, at each protected region the pitch may or may not need manual adjusting to be in tune with the Guide. There is a faster, easier and better solution.